Rover has manufactured an affordable zero-turn for the customer that fits all budgets! This is exactly what you call value for money. The zero turn rover enables you to shave time off how long it takes to mow your lawns as its added manoeuvrability makes cutting your lawns so much easier! Powered by a Kohler 7000 Series engine you are getting a high quality engine with plenty of power (V-twin 20hp) at a discount price. The generous 42" pressed deck gives you plenty of width but not too wide enabling you to still tackle those tight areas. 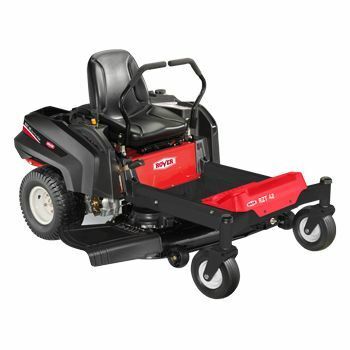 The dual EZT transmission will translate into a smooth ride making mowing your lawn more enjoyable and easier. Also coming with a massive 5 year (200 hour) domestic unit warranty and 2 year engine warranty giving you the piece of mind that it is a product backed by the manufacturer. 90 day unit and engine commercial warranty. Rover has enabled consumers with a lower budget to buy a lawn mower with zero turn capabilities without breaking the bank! It's manoeuvrability will save you time and effort making it easier to get round obstacles in your backyard. The 42" pressed cutting deck is generous in size so your lawns don't take all weekend to mow but is still small enough to reach into the tight areas on your block and in-between trees. The huge Kohler 20HP V-Twin engine is a high quality product that can be trusted. To put things into perspective this same engine use used on some of the more expensive Toro mowers! Meaning you will have plenty of grunt to tackle your backyard without any issues.